This Father's Day, give dad space for a workbench, fishing gear, sports equipment, lawn equipment, and more! Before getting started, consider the functions of your garage. There are hundreds of different uses for a garage, and most of the time protecting your cars from the elements is not one of them. Once you have a better idea of what you are organizing for, you can get started organizing. The key to organizing is to have an adequate garage organization system in place, and to be decisive. You will want to have organizer systems to handle things like gardening equipment, bikes, and sports gear. 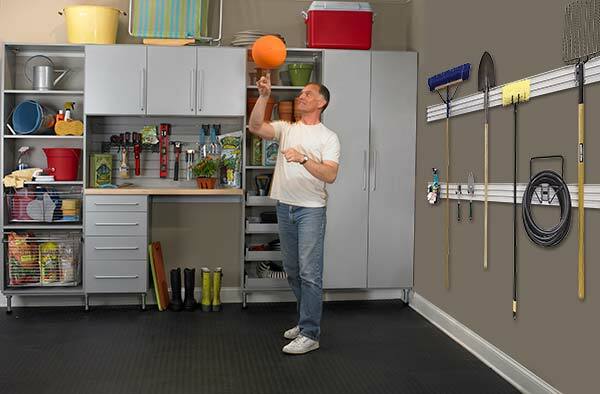 A well designed garage organization system can make a huge difference in keeping your garage organized longer. While sorting through your garage clutter, you will want to make quick decisions about what you are keeping and placing in an organizational system and what you are tossing. Garages tend to be storeage dumps for items that you have delayed making decisions on over the year. By going through the clutter as quickly and confidently as possible you will see fast and long lasting results that will save time in the future by allowing you to find items quickly! Want to get started on your own Closet Works garage project this summer? Call us toll free at 800-4-CLOSET or visit us our appointment page to set up a free consultation.